Musicians in Israel are mourning the death today of Andre Hajdu, one of the country’s most learned and modest composers. A student of Kodaly in Budapest and of Messaien in Paris, he settled in Jerusalem in 1966 and applied himself to exploring Jewish roots in music. As head of the music department at Bar-Ilan University, he gently mentored two generations of composers and ethnomusicologists. He and I had two intense Mahler conversations in which we disagreed totally and amicably. He said once that he liked his audience to feel pleasure – amid some suffering. Andre Hajdu is one of the few who does touch the immortal. – both as a composer and person – one of the most unforgettable people I have ever known. I first met him in 1979 – orthodox Jewish, harpsichordist, and composer, surrounded by his seven (really 7?) children scampering around on the floor. Hard not to imagine a resemblance to a Jewish J.S. Bach. I saw him just a few weeks ago on a visit to Israel. I held his hand as I reminisced with his wife, about other times, and his first trip to New York. Andre Hajdu: A lesson for us all in what it is to be a true original in every way. I am blessed to have known him. I vividly recall a presentation of his in 1976, where he described how he had become religious. 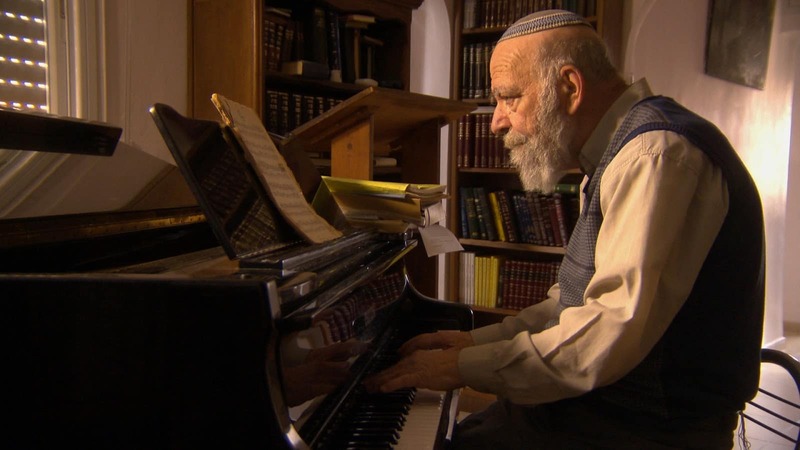 He had embarked on a mission to record and preserve how families of various ethnicities sang “Shalom Aleychem,” recordings which he then played for us, on a reel-to-reel recorder. The recording experience had moved him so deeply, he said, that it made him become a Ba’al Teshuva, newly-Orthodox. As we listened with him, it was obvious how emotionally moved he was even then, even after having heard these recordings many times. I never met him again, but it was obvious what a humble and spiritual man he was. … which does him more justice than the video. I had the great privilege of studying with Andre Hajdu at both the Rubin Academy of Music in Jerusalem and Bar- Ilan University between 1977-1981. More than teaching music, he WAS the music. He had a modest, yet brilliant way of explaining complex concepts of musical terms in the most understandable way. Doctoral students in composition would follow him around on the bus from school to school to sit in on his first year theory classes. I also had the wonderful opportunity to visit him at home and to interact with his wonderful family. The seder that my sister and I attended at his home was one I will never forget. He was brilliant, compassionate, humble, and had a great sense of humor. He will be greatly missed. May his memory be a blessing to us all.